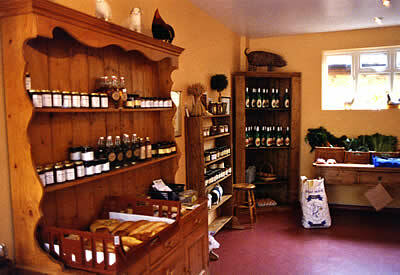 Meadows Farm Shop evolved in 2003 following the demand for quality food and the popularity of our stand at the local Farmers Market. Opening on a Thursday, Friday and Saturday, we take pride in producing a premium product to the customer who appreciates fine food. We can assure our customers that the meat we sell has been reared at Home Farm, thus providing full traceability and assurance of the highest welfare standards. 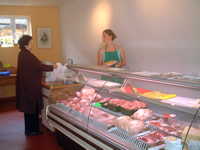 Rather like the butchers shops of old, we have our own butchery facilities within the shop, which means we are able to provide specific cuts of meat that customers request. 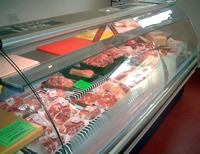 On offer are our own lamb, beef and pork. Order can be taken for boxes of lamb, beef and pork for the freezer, as well as half lambs and half a pig for the freezer. The shop also stocks fresh food from local producers such as free range eggs, fresh free range chickens, local cheeses, fresh fruit and vegetables, homemade cakes, ice-creams, jams, preserves, pickles, chutneys, honey, fruit juices, fresh bread and croissants. Meadows Farm has a regular stall at the following Farmers Markets: Cheltenham, Tewkesbury and Cirencester. A diary of Farmers' Markets within Gloucestershire can be found here.